The indicator is available for one period 2005-2013 at NUTS-3 level. Indicator should be updated annually with floating periods (i.e. 2006-2012, 2007-2013 etc.). Data available at NUTS-3 level and higher (except as indicated). NUTS-3 preferred spatial level. 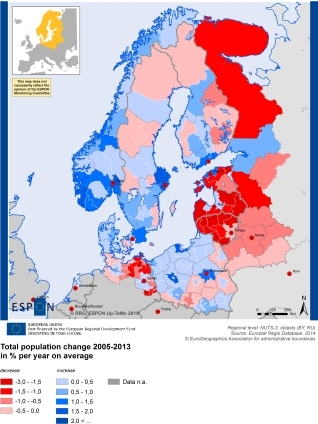 Eurostat Regio Database, Rosstat and Belstat.